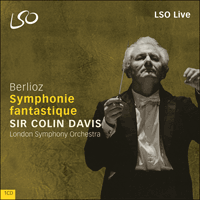 One of the greatest conductors of Berlioz's music, Sir Colin Davis presents a sensational reading of the composer's symphonic masterpiece. The recording captures the breathless exhilaration of the live performances to perfection. Hector Berlioz was born in south-east France in 1803, the son of a doctor. At the age of 17 he was sent to Paris to study medicine, but had already conceived the ambition to be a musician and, after a year at the School of Medicine, became a pupil of the composer Jean-François Le Sueur. Within two years he had composed the Messe solennelle, performed in 1825. In 1826 he entered the Paris Conservatoire, winning the Prix de Rome four years later. Gluck and Spontini were important influences on the formation of his musical style, but it was the discovery of Beethoven at the Conservatoire concerts, inaugurated in 1828, that was the decisive event in his apprenticeship, turning his art in a new direction: towards the dramatic concert work, incarnating a poetic subject or idea that is 'everywhere present' yet subservient to musical logic. His first fully characteristic large-scale work, the autobiographical Symphonie fantastique, followed in 1830. After a year in Italy he returned to Paris and began what he later called his 'Thirty Years War against the routineers, the professors and the deaf'. The 1830s and early 1840s saw a series of major works: Harold en Italie (1834), Benvenuto Cellini (1836), the Grande Messe des morts (1837), the Shakespearean dramatic symphony Roméo et Juliette (1839), the Symphonie funèbre et triomphale (1840), and Les nuits d'été (1841). Some were well received; but, quite early on, he discovered that he could not rely on his music to earn him a living and support his wife and child. He became a prolific and influential critic – a heavy burden for a composer but one that he could not throw off. In the 1840s he took his music abroad, and established a reputation as one of the leading composers and conductors of the day. He was particularly celebrated in Germany (where Liszt championed him), in Russia (where the receipts from his concerts paid off the debt incurred from the Parisian failure of La damnation de Faust in 1846), in Prague, Vienna, Budapest and London. These years of travel produced much less music: though he wrote the Te Deum (1849) it had to wait six years to be performed. But in 1854 the success of L'enfance du Christ in Paris encouraged him to embark on a project long resisted: the composition of Les Troyens, an epic opera based on the Aeneid, which would assuage a lifelong passion and pay homage to two great idols, Virgil and Shakespeare. Although Béatrice et Bénédict (1860–62), the comic opera after Shakespeare's Much Ado About Nothing, written for Baden-Baden, came later, Les Troyens (1856–8) was the culmination of his career. It was also the cause of his final disillusionment and the reason, together with increasing ill health, why he wrote nothing of consequence in the remaining six years of his life. The work was cut in two, and Part 2 only performed, in 1863, in a theatre too small and poorly equipped. Berlioz died in 1869. With all its innovations – including the introduction of instruments, textures and rhythms new to symphonic music – the Symphonie fantastique has its roots in the music of the past: first, Gluck and Spontini, whose operas were for several years Berlioz's main diet and whose melodic style he absorbed into his inmost being when he first came to Paris in 1821, a boy of 17 who had never heard an orchestra; then Weber, whose Freischütz enchanted him at the Odéon in 1824–5; and finally Beethoven, discovered at the Conservatoire concerts in 1828. Beethoven, with his revelation of the symphony as a dramatic form par excellence, was the springboard for Berlioz's great leap into unknown territory. True, no-one had composed symphonic music or used the orchestra quite like this before. As Michael Steinberg says, 'no disrespect to Mahler or Shostakovich, but this is the most remarkable First Symphony ever written'. Certainly, it was typical of Berlioz's boldness and freedom of spirit that his first major orchestral work should comprise a mixture of genres analagous to what the Romantic dramatists were attempting after the example of Shakespeare, and that in doing so he should override the normal categories of symphonic discourse and create his own idiosyncratic version of classical form in response to the demands of the musical drama. Yet the score presented at the Conservatoire in December 1830 was, to him, the logical consequence of the revelation he had had two years earlier in the same hall. It was addressed to the same eager young public and performed by many of the same players, under the same conductor, François Antoine Habeneck. Rêveries – Passions: Slow introduction; sadness and imagined happiness, creating out of the state of yearning an image of the ideal woman (Allegro), represented by the idée fixe, a long, asymmetrically phrased melodic span, first heard virtually unaccompanied, then gradually integrated into the full orchestra. The melody, in its alternate exaltation and dejection, its fevers and calms, forms the main argument. At the end, like a storm that has blown itself out, it comes to rest on a series of solemn chords. Un bal: At which the beloved is present. Waltz, at first dreamlike, then glittering, finally garish. Middle section with the idée fixe assimilated to the rhythm of the dance. Marche au supplice: The artist has killed his beloved and is now marched through the streets. The dreams of the first three movements are now intensified into nightmare and the full forces deployed: massive brass and percussion, prominent (and grotesque) bassoons. The idée fixe reappears pianissimo on solo clarinet, cut off by the guillotine stroke of the whole orchestra. Songe d’une nuit de sabbat: Sabbath Strange mewings, muffled explosions, distant cries. The executed lover witnesses his own funeral. The beloved melody, now a lewd distortion of itself, joins the revels. Dies irae, parody of the church's ritual of the dead. Witches' round dance. The climax, after a long crescendo, combines round dance and Dies irae in a tour de force of rhythmic and orchestral virtuosity. The opéra-comique Béatrice et Bénédict that Berlioz based on Shakespeare's Much Ado About Nothing was first performed in the summer of 1862, when it inaugurated the newly built theatre at the fashionable spa-town of Baden-Baden. During its composition, Berlioz was often ill and in pain; but the music breathes an air of exuberant gaiety, only momentarily touched with sadness. Its character is summed up by the brilliant overture (woven out of half a dozen different numbers in the score): racy, teasing, sharp-fingered, like the war of words behind which Beatrice and Benedick hide their mutual attraction, but also with warmth of heart and a delicate spirit of fantasy, as we hear in the expressive melody of the slower section and its magical pianissimo conclusion, taken from the Nocturne that closes Act 1. However, it is the opening theme, a glinting, mercurial figure that dominates the overture. Its nimble triplet rhythm and angular dotted phrase work their way in everywhere and spread their laughter throughout the musical texture of the two allegro sections. This is the music to which Beatrice and Benedick, at the end of the opera, celebrate love as 'a torch, a flame, a will-o'-the-wisp, coming from no-one knows where, gleaming, then vanishing from sight, to the distraction of our souls'. Hector Berlioz est né à La Côte-Saint-André, dans l'Isère, en 1803. Fils d'un docteur, il fut envoyé à 17 ans faire sa médecine à Paris. Mais son dessein avait toujours été une carrière de musicien; après un an à la faculté de médecine, il devint l'élève du compositeur Jean-François Le Sueur. Deux ans plus tard, il avait composé sa Messe solennelle, créée avec succès en 1825. En 1826, il entra au Conservatoire, remportant le prix de Rome quatre ans plus tard. Gluck et Spontini influencèrent de manière importante le développement de son style musical, mais l'événement décisif de son apprentissage fut la découverte de Beethoven aux Concerts du Conservatoire, fondés en 1828. Son art s'orienta alors vers des œuvres de concert d'essence dramatique, dans lesquelles un sujet poétique ou une idée innerve la partition, tout en se soumettant à une logique musicale. Sa première pièce d'envergure pleinement représentative de son art, l'autobiographique Symphonie fantastique, naquit dans la foulée en 1830. Après une année passée en Italie, il rentra à Paris et commença ce qu'il appellerait plus tard sa «guerre de Trente Ans contre les routiniers, les professeurs et les sourds». Les années 1830 et le début des années 1840 virent naître une série d'œuvres majeures: Harold en Italie (1834), Benvenuto Cellini (1836), la Grande Messe des morts (1837), la symphonie dramatique shakespearienne Roméo et Juliette (1839), la Symphonie funèbre et triomphale (1840) et les Nuits d'été (1841). Quelques-unes de ces partitions furent accueillies avec succès; mais Berlioz se rendit compte assez rapidement qu'il ne pouvait compter sur sa musique pour gagner sa vie et subvenir aux besoins de sa femme et de son enfant. Il devint alors un critique musical à la fois prolifique et influent. Ces activités pesaient lourdement sur ses activités de compositeur, mais il ne pouvait s'en dispenser. Dans les années 1840, il présenta sa musique à l'étranger et s'imposa comme l'un des compositeurs et chefs d'orchestre majeurs de son temps. Il jouissait d'un prestige particulier en Allemagne (où il reçut notamment le soutien de Liszt), en Russie (où les recettes de ses concerts couvrirent les dettes occasionnées par l'échec de la Damnation de Faust en 1846), à Prague, à Vienne, à Budapest et à Londres. Durant ces années de tournées, il composa moins abondamment; écrit en 1849, le Te Deum dut attendre six ans avant d'être créé. Mais en 1854 le succès de l'Enfance du Christ à Paris encouragea Berlioz à se lancer dans un projet longtemps repoussé: la composition des Troyens, un opéra épique d'après l'Enéide, qui assouvirait une passion qui le tenaillait depuis longtemps et rendrait hommage à deux de ses grandes idoles, Virgile et Shakespeare. Même si Berlioz devait encore écrire pour Baden-Baden Béatrice et Bénédict (1860-1862), opéra-comique d'après Beaucoup de bruit pour rien de Shakespeare, Les Troyens (1856-1858) constitue le sommet de sa carrière. Cet opéra lui causa également une dernière désillusion, si bien que, de plus en plus malade par ailleurs, il n'écrivit plus rien d'envergure dans les six années qu'il lui restait à vivre. L'ouvrage fut scindé en deux, et seule la seconde partie fut montée, en 1863, dans un théâtre aux dimensions insuffisantes et mal équipé. Berlioz s'éteignit en 1869. Quel que soit son caractère innovant (avec notamment l'introduction d'instruments, de textures et rythmes inusités jusqu'alors dans la musique orchestrale), la Symphonie fantastique prend racine dans la musique du passé: Gluck et Spontini, tout d'abord, dont les opéras formèrent pendant plusieurs années l'ordinaire de Berlioz et imprégnèrent son style mélodique au plus profond lorsque débarqua à Paris, en 1821, ce jeune homme qui n'avait encore jamais entendu un orchestre; Weber ensuite, dont le Freischütz l'enchanta, à l'Odéon, en 1824–1825; Beethoven enfin, dont il découvrit la musique aux Concerts du Conservatoire en 1828. Beethoven avait révélé que la symphonie était un genre dramatique par excellence; son œuvre fut le tremplin grâce auquel Berlioz put s'engouffrer dans des territories inconnus. A la vérité, personne n'avait composé de musique symphonique ni utilisé l'orchestre de cette manière avant Berlioz. Comme le dit Michael Steinberg, «sans nier les mérites de Mahler ou de Chostakovitch, il s'agit de la première symphonie la plus remarquable jamais composée». En entreprenant un mélange des genres analogue à ce que les auteurs de theatre romantiques tentaient de faire à l'exemple de Shakespeare, la première page orchestrale majeure de Berlioz était significative de sa hardiesse et de sa liberté de penser: l'œuvre brisait les categories habituelles du discours symphonique et il créait ainsi un avatar de la forme classique qui lui était propre et répondait aux exigences du drame musical. Pourtant, la partition qu'il présenta au Conservatoire en décembre 1830 lui semblait le prolongement logique de la révélation qu'il avait eue deux ans plus tôt dans la même salle. Elle s'adressait au même public jeune et enthousiaste, était interprétée par plus ou moins les mêmes musiciens et dirigée par le même chef, François Antoine Habeneck. Certes, elle comportait des éléments autobiographiques; non seulement sa passion largement exhibée et non payée en retour pour l'actrice shakespearienne Harriet Smithson, mais tout ce qu'il avait vécu jusqu'alors dans son cœur et dans son âme – comme il l'écrivit sur la page de garde du manuscrit, citant un poème de Victor Hugo: «Tout ce que j'ai souffert, tout ce que j'ai tenté, […] Les amours, les travaux, les deuils de ma jeunesse» (les Feuilles d'automne). Aux yeux de Berlioz, cependant, tout cela ne différait pas vraiment de ce que Beethoven avait produit dans ses Cinquième et Sixième Symphonies. Prolongeant l'œuvre de ce compositeur, il pouvait s'appuyer sur une expérience personnelle intense et donner des titres à ses mouvements pour faire ressortir au maximum l'expressivité inhérente à la musique, tout en élargissant son cadre de référence et estomper encore davantage la distinction entre la musique dite «pure» et la musique liée à une situation humaine identifiable (la forme la plus fréquente depuis les temps les plus reculés). Toutes sortes d'idées extra-musicales pouvaient s'immiscer dans la composition, mais la musique demeurait souveraine, tout élément externe se pliant à la discipline de la structure musicale. Rêveries – Passions: Introduction lente; tristesse et joie imaginaire font surgir d'un état de désir l'image de la femme idéale (Allegro), représentée par l'idée fixe: une longue mélodie au phrasé asymétrique, entendue tout d'abord pour ainsi dire sans accompagnement, puis intégrée progressivement au sein de l'orchestre au complet. La mélodie, avec son alternance entre exaltation et abattement, ses moments de fièvre et de repos, forme le principal sujet du discours. A la fin, elle se stabilise sur une série d'accords solennels, comme une tempête qui se serait désamorcée d'elle-même. Un bal: Où est présente la bien-aimée. Une valse perçue tout d'abord comme en rêve, puis brillante et enfin tapageuse. Section médiane faisant apparaître l'idée fixe, assimilée au rythme de la danse. Marche au supplice: L'artiste a tué sa bien-aimée; il est conduit au supplice. Les rêveries des trois premiers mouvements se sont transformées en cauchemar et toutes les forces orchestrales sont déployées: des cuivres et des percussions massifs, des bassons saillants (et grotesques). L'idée fixe réapparaît pianissimo à la clarinette solo, interrompue par le bruit de la guillotine produit par l'orchestre au complet. Songe d’une nuit de sabbat: Etranges miaulements, explosions étouffées, cris au loin. L'amant exécute assiste à ses propres funérailles. La mélodie aimée, réduite à une affreuse distorsion d'elle-même, se joint aux réjouissances. Parodie du Dies irae de la Messe des morts. Ronde de sorcières. Après un long crescendo, on atteint le point culminant: la danse et le Dies irae se superposent avec une virtuosité rythmique et orchestrale époustouflante. L'opéra-comique Béatrice et Bénédict composé par Berlioz d'après Beaucoup de bruit pour rien de Shakespeare fut créé en été 1862, à l'occasion de l'inauguration du théâtre de Baden-Baden, ville thermale à la mode. La composition de l'œuvre s'accompagna de souffrances et de maladies nombreuses; la musique dégage cependant une gaieté exubérante, n'étant voilée de tristesse qu'en de rares endroits. Mêlant une demi-douzaine de motifs tirés de la partition, la brillante ouverture en résume bien le caractère: piquante, taquine, affûtée, comme la bataille en paroles derrière laquelle Béatrice et Bénédict cachent l'attirance qu'ils éprouvent l'un envers l'autre, mais également chaleureuse, parcourue par un esprit délicat et fantasque, comme on peut l'entendre dans la mélodie si expressive de la section lente et dans sa conclusion pianissimo enchanteresse, issue du Nocturne qui referme l'acte I.
Hector Berlioz wurde 1803 im Südosten Frankreichs als Sohn eines Arztes geboren. Mit siebzehn Jahren schickte man ihn nach Paris, um Medizin zu studieren, doch er war längst fest entschlossen, Musiker zu werden, und ging nach einem Jahr an der medizinischen Fakultät als Schüler zu dem Komponisten Jean-François Lesueur. Binnen zwei Jahren hatte er die Messe solennelle komponiert, die 1825 mit Erfolg aufgeführt wurde. Im Jahr 1826 trat er ins Pariser Conservatoire ein, und vier Jahre später gewann er den Prix de Rome. Gluck und Spontini übten wesentlichen Einfluss auf die Herausbildung seines musikalischen Stils aus, doch das entscheidende Ereignis seiner Lehrjahre war die Entdeckung Beethovens anlässlich der 1828 ins Leben gerufenen Konzerte am Konservatorium. Sie gab seiner Kunst eine neue Richtung: hin zum dramatischen Konzertwerk, in dem ein poetisches Thema bzw. eine Idee realisiert wird, die ‘allgegenwärtig’, aber dennoch der musikalischen Logik unterworfen ist. Die Symphonie fantastique, sein erstes groß angelegtes Werk, in dem dieser charakteristische Stil voll ausgebildet ist, folgte 1830. Nach einem in Italien verbrachten Jahr kehrte Berlioz nach Paris zurück und begann seinen ‘Dreißigjährigen Krieg gegen die Routiniers, die Professoren und die Gehörlosen’, wie er spatter meinte. In den 1830er- und frühen 1840er-Jahren kam eine Reihe bedeutender Werke heraus: Harold en Italie (1834), Benvenuto Cellini (1836), die Grande Messe des morts (1837), die dramatische Shakespeare-Sinfonie Roméo et Juliette (1839), die Symphonie funèbre et triomphale (1840) und Les nuits d'été (1841). Einige davon wurden positiv aufgenommen, doch Berlioz entdeckte schon bald, dass er sich nicht darauf verlassen konnte, mit seiner Musik seinen Lebensunterhalt verdienen bzw. Frau und Kind ernähren zu können. Er wurde ein produktiver, einflußreicher Kritiker – eine schwere Bürde für einen Komponisten, die er jedoch nicht einfach abwerfen konnte. In den 1840er-Jahren ging er mit seiner Musik ins Ausland und machte sich einen Namen als einer der führenden Komponisten und Dirigenten seiner Zeit. Besonders gefeiert wurde er in Deutschland (wo Liszt sich für ihn einsetzte), in Russland (wo die Einkünfte aus seinen Konzerten hoch genug waren, um die Schulden abzuzahlen, die er im Anschluss an den Mißerfolg von La damnation de Faust in Paris im Jahr 1846 angehäuft hatte), in Prag, Wien, Budapest und London. Diese Reisejahre brachten deutlich weniger Musik hervor: Berlioz schrieb zwar das Te Deum (1849), doch musste das Werk noch sechs Jahre auf seine Uraufführung warten. Immerhin aber ermutigte ihn 1854 der Erfolg von L'enfance du Christ in Paris, ein Projekt anzugehen, dem er lange widerstanden hatte: die Komposition von Les Troyens, einer epischen Oper auf der Grundlage der Äneis, die eine zeit seines Lebens gehegte Leidenschaft stillen und zwei großen Idolen Tribut zollen sollte: Vergil und Shakespeare. Béatrice et Bénédict (1860–1862), die für Baden-Baden komponierte komische Oper nach Shakespeares Viel Lärm um Nichts, kam zwar spatter hinzu, doch Les Troyens (1856–1858) bedeutete den Höhepunkt seiner Karriere. Darüber hinaus war die Oper Ursache seiner endgültigen Desillusionierung und neben seiner zunehmend schwachen Gesund heit der Grund, warum er in den letzten sechs Jahren seines Lebens nichts mehr von Bedeutung geschrieben hat. Das Werk wurde in zwei Teile geteilt, deren zweiter erst 1863 und in einem Theater aufgeführt wurde, das zu klein und schlecht ausgestattet war. Berlioz starb im Jahr 1869. Ungeachtet ihrer Neuerungen – darunter die Einführung von Instrumenten, Strukturen und Rhythmen, die für die sinfonische Musik neu waren – hat die Symphonie fantastique ihre Wurzeln in der Musik der Vergangenheit: erstens bei Gluck und Spontini, deren Opern mehrere Jahre lang Berlioz' täglich Brot waren und deren melodischen Stil er tief verinnerlichte, als er 1821 als 17-jähriger Junge, der noch nie ein Orchester gehört hatte, nach Paris kam, zweitens Weber, dessen Freischütz ihn 1824/25 im Odéon verzaubert hatte, und schließlich Beethoven, den er 1828 bei den Konzerten des Conservatoire entdeckte. Beethoven war mit seiner Offenbarung, dass die Sinfonie eine dramatische Form par excellence darstellt, war das Sprungbrett für Berlioz' großen Satz ins Ungewisse. Gewiss hatte niemand je zuvor solche sinfonische Musik komponiert oder ein Orchester so eingesetzt. Dazu sagt Michael Steinberg: ‘Ich will gegenüber Mahler oder Schostakowitsch nicht respektlos sein, aber dies is die bemerkenswerteste Erste Sinfonie, die je geschrieben wurde.’ Auf jeden Fall war es typisch für Berlioz' Kühnheit und geistige Freiheit, daß sein erstes bedeutendes Orchesterwerk ein Gemisch verschiedener Gattungen enthalten sollte, das dem entsprach, was die Dramatiker der Romantik dem Vorbild Shakespeares folgend versuchten, und dass er, sich über die normalen Kategorien des sinfonischen Ablaufs hinwegsetzend, auf die Anforderungen des Musikdramas reagierte und eine persönliche, höchst eigenwillige Version der klassischen Form schuf. Für ihn war die Partitur, die er im Dezember 1830 am Conservatoire vorlegte, allerdings die logische Folge jener Offenbarung, die er zwei Jahre zuvor dort im Konzertsaal erlebt hatte. Sein Werk war für das gleiche begeisterte junge Publikum gedacht und wurde überwiegend von denselben Musikern unter François Antoine Habeneck aufgeführt, demselben Dirigenten. Es wäre denkbar, dass es Autobiographisches verkörpert: nicht nur seine viel besprochene unerwiderte Leidenschaft für die Shakespeare-Darstellerin Harriet Smithson, sondern seine ganze emotionale und spirituelle Existenz bis zu diesem Zeitpunkt – wie er auf dem Titelblatt des Manuskripts bekennt, indem er ein Gedicht von Victor Hugo zitiert: ‘Alles, was ich gelitten, alles, was ich versucht … Die Liebschaften, die Mühen, die Trauerfälle meiner Jugend.’ Und doch unterschied sich all dies für Berlioz nicht grundsätzlich von dem, was Beethoven beim Komponieren seiner Fünften und Sechsten Sinfonie getan hatte. Indem er die Nachfolge Beethovens antrat, konnte er intensive persönliche Erlebnisse verarbeiten und Satztitel benutzen, um die der Musik innewohnende Expressivität deutlicher hervorzuheben; zugleich konnte er ihren Bezugsrahmen erweitern und die Unterschiede zwischen sogenannter absoluter Musik und solcher, die mit einer definierbaren menschlichen Situation verknüpft ist (was seit Anbeginn aller Zeiten für die Mehrheit aller Musikwerke gilt), noch weiter zu verwischen. Alle möglichen außermusikalischen Ideen konnten, begrenzt durch ein diszipliniertes musikalisches Gerüst, in die Komposition eingehen, ohne dass ihnen die Musik unterworfen worden wäre ‘mehr Ausdruck der Empfindung als Malerei’, wie Beethoven zu seiner ‘Pastorale’ schrieb. Das literarische Programm, das dem Publikum am Conservatoire vorgelegt wurde, stellte das Werk in seinen Zusammenhang; es bildete die Einleitung zu dem ‘instrumentalen Drama’ (so Berlioz' Vorwort), dessen ‘Grundzüge, da es ohne Sprache auskommen muss, vorab der Erklärung bedürfen’. Doch es ist nicht das Programm, das die Sinfonie zusammenhält und sie zu einem zeitlosen Beleg für die Inbrunst und die Qualen der jugendlichen Phantasie macht. Diese Aufgabe erfüllt die Musik. Rêveries – Passions: Leidenschaften. Langsame Einleitung; Trauer und eingebildetes Glück, die aus dem Zustand der Sehnsucht heraus ein Bild der idealen Frau schaffen (Allegro), dargestellt durch die idée fixe, eine lange, asymmetrisch phrasierte Melodiespanne, die zunächst so gut wie unbegleitet erklingt und dann allmählich in das gesamte Orchester eingeht. Die Melodie mit ihrer abwechselnd glückseligen und tief betrübten Stimmung, ihren Fieberanfällen und Ruhephasen, stellt das Hauptargument des musikalischen Diskurses dar. Am Ende kommt sie – gleich einem abklingenden Gewitter – auf einer Folge feierlicher Akkorde zur Ruhe. Un bal: auf dem die Geliebte zugegen ist. Walzer, erst verträumt, dann glanzvoll, schließlich protzig. Der Mittelteil mit der idée fixe ist dem Tanzrhythmus angeglichen. Marche au supplice: Der Künstler hat seine Geliebte umgebracht und wird nun durch die Straßen geführt. Die Träume der ersten drei Sätze verdichten sich nun zum Alptraum, und sämtliche Kräfte des Orchesters kommen zum Einsatz: massierte Blechbläser und Schlaginstrumente, hervorstechende (und groteske) Fagotte. Die idée fixe ist erneut pianissimo auf der Soloklarinette zu hören, abgeschnitten durch das Fallbeil der Guillotine im ganzen Orchester. Songe d’une nuit de sabbat: Seltsames Jaulen, gedämpfte Explosionen, ferne Schreie. Der hingerichtete Liebhaber wird Zeuge seiner eigenen Bestattung. Die geliebte Melodie stimmt nun als lüsterne Verzerrung ihrer selbst in das Gelage ein. Dies irae, Parodie des kirchlichen Totenrituals. Rundtanz der Hexen. Der Höhepunkt verbindet nach langem Crescendo Rundtanz und Dies irae in einer Glanzleistung rhythmischer und orchestraler Virtuosität. Die opéra-comique Béatrice et Bénédict, die Berlioz auf der Grundlage von Shakespeares Viel Lärm um nichts schrieb, wurde im Sommer 1862 uraufgeführt, und zwar zur Einweihung des neu erbauten Theaters im eleganten Kurort Baden-Baden. Während ihrer Entstehungszeit war Berlioz oft krank und von Schmerzen geplagt; doch die Musik strahlt überschwengliche Fröhlichkeit aus, nur gelegentlich von einem Hauch von Traurigkeit durchweht. Die brillante Ouvertüre (in der ein halbes Dutzend verschiedener Nummern der Partitur miteinander verwoben werden) charakteririsiert treffend das Gesamtwerk: Sie ist flott, neckisch, flink wie die Wortgefechte, hinter denen Beatrice und Benedikt ihre gegenseitige Zuneigung verbergen, aber auch mit Herzensgüte und einem feinen Sinn furs Phantastische gesegnet, wie in der ausdrucksvollen Melodie des langsameren Abschnitts und ihrem (der Nocturne am Schluss des ersten Akts entnommenen) zauberhaften, pianissimo gehaltenen Ausklang zu hören ist.